We’re on a breakfast theme for a few days. 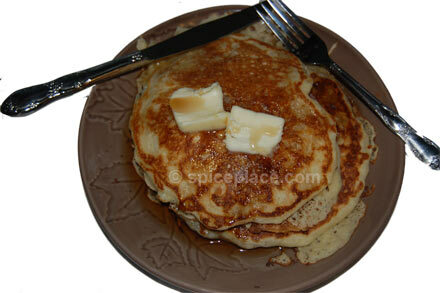 Today we’re making Buttermilk Pancakes with Vanilla Extract served with pure Maple Syrup. These are absolutely delicious, light and fluffy pancakes. This is absolutely delicious. Oil your griddle and start heating it over medium heat. In a small cereal bowl, beat the egg. In a medium size bowl, mix the beaten egg with buttermilk, then add the flour, sugar, and baking powder. Add the Pure Vanilla Extract, mix in. Beat in the melted butter. Don’t worry about mixing the batter so muxh to mix in all of the flour. The lumps will work themselves out in the cooking. Test your griddle for readiness by dropping a drop of water on top. It should sizzle and dance around if the griddle is hot enough. Once ready, pour or ladle the batter onto the griddle. Be careful to take your time and not pour out too much batter — if you do you’ll have giant pancakes. Your looking for a nice 4 -6″ pancake. Cook the pancakes until they bubble on top. If this is your first pancake experience, then left up a side and peak underneath the pancake. If brown, then flip the pancake over and cook the other side. Otherwise wait 20 seconds or so and peak again. Serve with Pure Maple Syrup. I like to add an over-easy egg between the layers of pancakes and soak up the yolk with the pancake.